We have just blown past the 6-year mark since I first registered this blog! The ever-creative “First post:)” was on March 3, 2009. The traditional year 6 gift is candy. To celebrate, we decided to clear the decks of random ads. It’s one of the changes that I have talked about behind the scenes for quite some time. A clean format guarantee for you the readers is important to me. It is clean on the back-end because we don’t book ads of any kind. Any ads shown were never going to match your interest or ours. This space is simply about information, and hopefully is a source of interaction as well. Now what you see is in step with this intention. Our site hits are growing, and this is in part thanks to 200+ followers to the @irieknit Twitter feed. Not your average give away but here’s to ad-free posting! Hope you like the virtual candy for our 6th! 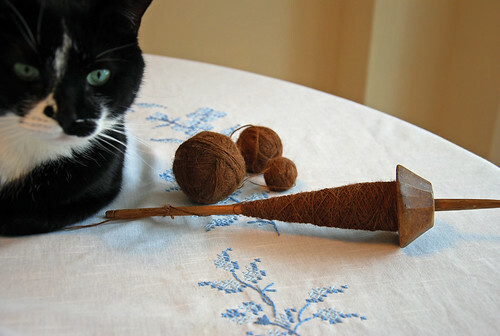 Under Melvin’s supervision this Alpaca spin on my carved Andean pushka went on to become approx. 379 yds of 2-ply yarn. Just a slice of the busy month of knits, spins and even a weave that I want to process for sharing… ad-free! 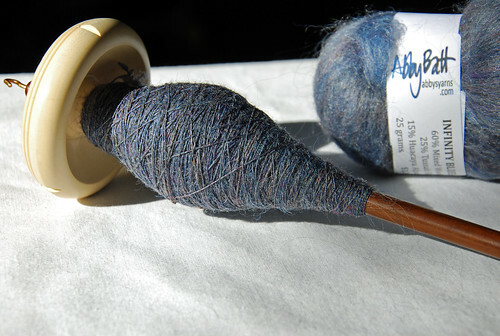 Categories: Good Gnus, Spinning | Tags: Alpaca, Andean pushka spindle, handspun yarn, Tabachek drop spindle | Permalink.